One of the most frequent questions we get asked here....well, after questions about the composting toilet and ones implying that we're out of our minds for living on a shantyboat...is, oddly, about doing dishes in the galley, so I thought, in the midst of everything else, that I'd take a moment and tell you how we handle that, and successfully. This is a picture of our galley during installation. 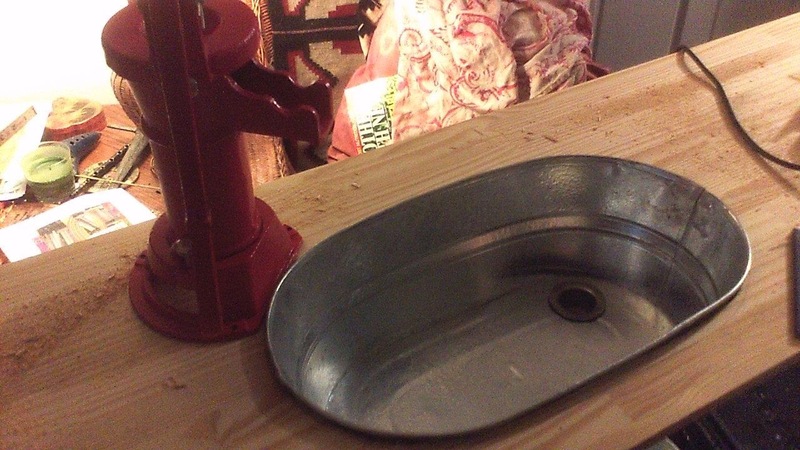 Note that the sink is actually an oblong galvanized tub with a drain cut into it. We use a simple pitcher pump to pull water from the river, pump it into the sink, and then drain it into a bladder for disposal on shore. We don't just have one tub, we have two identical ones. We use one for wash and one for rinse. Filling the rinse tub. You can see the wash tub, full of dirty dishes, beneath it. Yes, yes, yes, I know, River Water isn't sterile. We both are food service safety managers and know the risks. So we do what restaurants do that use hand wash. We keep a squeeze bottle of chlorine bleach handy and add it to the rinse water to disinfect the water and the dishes. So in practice, once we fill both basins, we add soap and boiling water to the wash basin to raise the temp to around 100F. Warm water not only cleans better, in winter the river water is freakin' COLD! 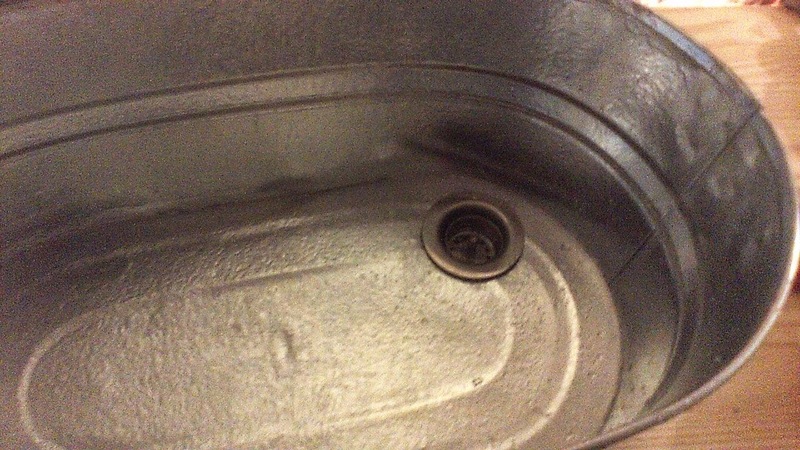 So we wash in the warm, soapy water, rinse and disinfect (allowing the dishes to remain in the water for about two minutes) in the second tub, and then air dry. The system has been surprisingly easy, nobody's gotten sick from it, and it would also work well in any tiny home or cabin. Originally our intention was to nest the two tubs when not in use, but the sink (probably like yours) is too wonderful a catch tub for dirty dishes(one must be careful with this, as it is well known that dirty dishes, left to their own devices, will breed and quickly fill the sink), so we wound up hanging the rinse tub from a hook adjacent to the galley counter. Today is the first day of spring here, and it is, of course FREAKING SNOWING!!!! I am so tired of this winter. Next week, however, looks quite a bit warmer, and the spring seems to proceed from here. Let's hope. On the kitty front, much to our surprise, our furry second mate has been steadily improving, gradually getting stronger from her stroke and gaining more and more use of her partially paralyzed limbs. I am glad of this because I had visions of having to rig some kind of Stephen Hawkins motorized cat chair, complete with synthetic speech. Amusing and Terrifying, yes? Anyway, thanks for all your good wishes for Kallisti. We actually do read her your letters. Okay, its snowing again, and we're bored. More later. We just put a new recipe and some video over on our small kitchen cooking blog Onboard Cooking, and there are new posts on Morgainne's Artist's site Life, Art, Water. Check em out. Hey, if you want to know when we post new stuff, hit the subscribe button and we'll make sure you know. If you're of a mind, click on and check out some of our kind advertisers, which is how we're able to afford to do this stuff. Wheres the button for email updates? Down here in Panama, except for newly-built, gringo-owned houses, most houses DON'T have hot water. In the stores you'll find tubs of special dish-washing soaps. That's right, TUBS, as in "I Can't Believe It's Not Soap." The stuff is a solid and you take a wet dish rag or sponge and rub it around on the solid stuff and it lathers up nicely and it's designed SPECIFICALLY for washing in cold water. There are several different brands. I like Axion, myself, and it comes in several different "flavors" like lemon, etc. When I lived on my sailboat I had a two water system for dishwashing. I had two foot-activated pumps. One drew water from the sea, and the other from the fresh water tank which, when cruising, I kept filled with rain water. I'd WASH the dishes in salt water (Joy dishwashing liquid is the ONLY one that will make suds with salt water) and then rinse the dishes with fresh water. What's the brand name, Richard? Would love to find some. Woo hoo! You've already done with your sink what I want to do, so it's great to see that the concept works, and in a lovely way.